Sometimes we find ourselves caring for a pregnant cat, be it a stray that you’ve taken in or someone else’s cat you’re caring for. Regardless, I don’t encourage allowing cats to become pregnant, unless you’re a licensed breeder, I’m a proponent of spaying and neutering your pet. But I do always get excited when witnessing a pregnant cat preparing to give birth. I just love seeing cute kittens being born. When it comes to providing good health to an expecting feline, there are some important guidelines that you should consider. Pregnancy (and subsequent nursing) causes a depletion in the amount of calcium in the bloodstream. This condition can result in eclampsia, a life-threatening disease. Although it more often occurs during nursing, it can occur during the last stages of pregnancy. A calcium supplement can help prevent this potential problem, particularly when caring for a pregnant stray cat. In addition to quality food, make sure that fresh, clean water is available at all times. The best way to provide this essential is with an automatic water fountain. This can be anywhere from sharing your bed, to a cardboard box lined with a fluffy towel or blanket, to a comfortable commercial bed designed for cats. As your pregnant cat’s abdomen begins to enlarge, make sure her litter box is low enough for easier ingress and egress. Keep the box scrupulously clean to avoid possible infections from soiled litter. Refresh your knowledge of litter box cleaning techniques with this article on Litter Box Maintenance. This should go without saying, but if your cat became pregnant because of unlimited outdoor privileges, you really should train yourself and her to keep her inside. This is extremely important for her safety and your peace of mind. Remember after the mother has delivered her kittens, she will spend the first few weeks with them feeding, cleaning and regulating their body temperature by keeping them warm. Make sure you’re providing a quiet area for her and the kittens away from other pets and high traffic areas of the home. 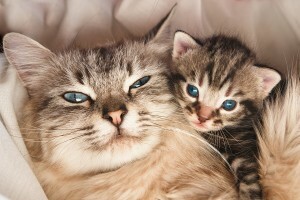 Take the mother and kittens to your vet to have a check-up within the first month to be sure she is maintaining good health as well as her kittens to insure they live a long and healthy life.